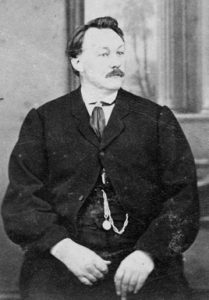 Charles Robert Thatcher, poet, songwriter and singer, was the son of an antiques dealer from Bristol who, at the age of 21 became interested in the upsurge in gold mining in Australia. He went with friends to Melbourne to try to make his fortune. After several unsuccessful attempts at the Bendigo digs they eventually hit the jackpot. Thatcher’s share of the claim was £1000, a not inconsiderable sum at that time. He promptly abandoned the dig as he declared himself satisfied with the fortune he had made. After deciding that a life of hard manual labour was not for him he joined the orchestra at the Royal Victoria Theatre and continued to entertain audiences in between musical pieces with his original songs. These would cover everything from cricket and horse-racing to nuisance dogs and troubles with friends. Thatcher proved to be a very popular singer with a unique ability to write and perform catchy songs. These collections were entitled The Dunedin Songster, Auckland Vocalist – both published in 1862 and Songs of War published in 1864. In 1861 Thatcher married singer Annie Vitalli and they had two daughters. They moved to New Zealand where they resided until 1866. They moved between New Zealand and Australia several times over the following years although his final trip to New Zealand was taken alone. He reunited with his family and they moved to London, England in 1870 where he collected and sold curios for a living. Charles Thatcher died from cholera in Shanghai, China in September 1878.